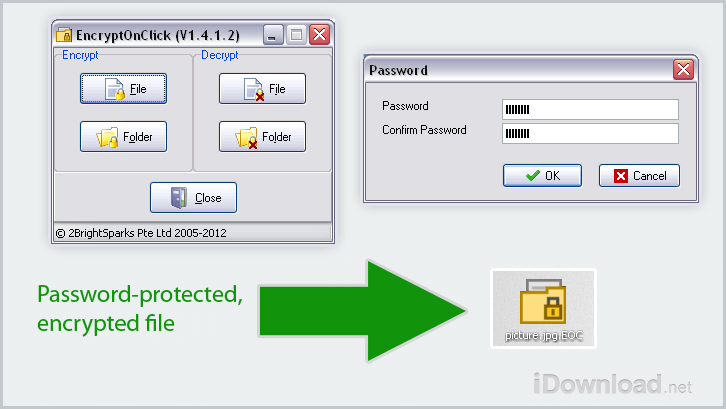 EncryptOnClick is free encryption software for Microsoft Windows. This app allows you to easily protect your files and folders using 256-bit AES (Advanced Encryption Standard) encryption. You can encrypt your pictures, Microsoft Word documents, text files, and others. File encryption is invaluable if your laptop is lost or stolen. Decrypting your files or folders can only be open with the correct password. You just launch EncryptOnClick, select the file or folder you want to encrypt, and then enter a password to decrypt it later. This program is lightweight and has a simple interface that I like, as you will notice in the screenshots below. 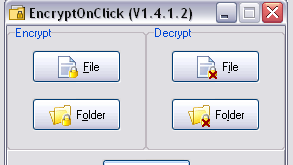 Encrypting a folder option will encrypt all the files within it. You can then decrypt all of them by opening the program again or by double-clicking on individual files. I find following this process easier for me at times. This software installs quickly and it is easy to use. Please note that it is very important that you remember your passwords because you will not be able to decrypt your files without it.